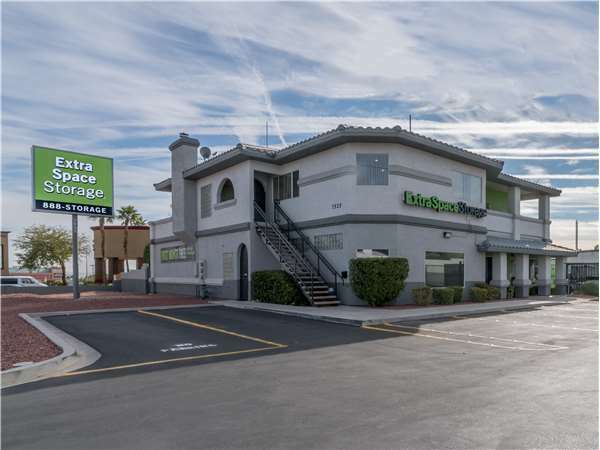 Extra Space Storage on W. Sahara Ave. is located on the north boundary of Spring Valley. This makes it easily accessible from both Spring Valley and Las Vegas. Just a block east of the intersection of Sahara and S. Buffalo Dr., you'll find our storage facility right next to Honda West and Volvo of Las Vegas. We're conveniently located for residents in surrounding neighborhoods, as well as students attending College of Southern Nevada. We're perfectly located for residents of neighborhoods surrounding our facility including Canyon Gate, The Lakes, Via Olivero Springs, Plantea Court, Sycamore Estates, and Aurora Estates. We're less than two miles away from each of these neighborhoods, so you don't have to go far to find secure, quality storage. This place is terrible. I wouldn't recommend them to anyone. We moved across the country using a container service. Extra Space Storage allowed us to have the container dropped onsite and allowed us the time we needed to have it unloaded into our storage space and extra time for the container service to arrange to have it picked up. All of the associates we've worked with were very knowledgeable, courteous, and helpful. There is ample space between units for maneuvering large vehicles and the property is always kept very clean at all time. This failty is very secure and clean. I have a small travel trailerand the staff even helped me back into a tight spot, and I didn't even need to ask. Of all the storage facilities we looked at Extra Space was the cheapest and exactly what we were looking for. When I say cheap I'm not talking quality I'm only talking price. Now I'm new to the storage rental community so I'm no expert here but so far I am completely satisfied with Extra Space. I checked several storage locations and none had the price and condition that this location did. Eazy to enter and exit. I'm very pleased. Thanks to the staff. Drive south on S Buffalo Dr. Pass All American Park and continue south on S Buffalo Dr. Turn left onto W Sahara Ave. Our facility is on your right, just before S Monte Cristo Way. Drive north on S Buffalo Dr and pass Spring Valley High School. Turn right onto W Sahara Ave. Our facility is on your right, just after S Pioneer Way. Drive west on W Sahara Ave. Make a U-Turn at S Pioneer Way onto W Sahara Ave heading west. Our facility is immediately on your right. Drive east on W Sahara Ave. Our facility is on your right, just before S Monte Cristo Way.